1) Boosted protein from the bean flours and the almond meal. 2) Versatile — use any 6 gluten-free (or gluten-full, for that matter) flours you desire or have on hand. The flours will all want different amounts of water, so that's where you'll have to adjust. 4) “Cheezy” from the nutritional yeast. 5) Delicious basic cracker recipe — use this recipe as a base (omitting the dill) and season it up with your favorite herbs. That's what I'll be working on this week. As I come up with variations, I'll come back and edit this recipe. Preheat oven to 350 degrees. Prepare one 16-inch pizza stone by greasing it or lining it with parchment paper. Or use two 11-inch by 13-inch baking sheets — flipped over and greased or lined with parchment paper. Mix all dry ingredients. Add oil and mix in, as well as you can. Add water, 2 tablespoons at a time, and mix. Keep adding water until the dough holds together. You may wish to mix it with your hands at some point. If it gets too wet, it will be too sticky. Press the dough into a flat circle on the pizza stone (or divide the dough into two parts, each pressed into a flat rectangle on a baking sheet). Using a combination of wet fingers and a greased rolling pin, roll the dough out very thin, about 1/8″ thick. If it breaks apart, press it back together with your fingers. Make sure the middle isn't more thick than the edges — remember, we want thin! Cut into squares with a pizza cutter. Sprinkle lightly with fine sea salt. 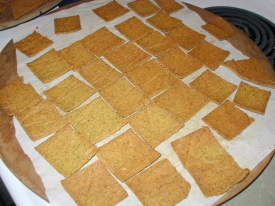 Bake for 30 minutes, then remove the edge crackers which are probably brown and crisp already. Return the middle crackers to the oven to finish baking, about 5 to 10 more minutes. You may wish to turn them over for this last part of the baking. Let cool. Store in an airtight container and just try to keep from eating them on the spot! Amazing! You make your own crackers! Yum, they look great. I am so lazy about baking though now that I’m gluten-free. I bought GF crackers recently though, I didn’t notice the price until I got home, $9.99! Wow, that is a steep price! Does it make you want to bake your own? 😉 Hint, hint. I looked at gf crackers the other day and couldn’t buy them. Not only was the price high but they had questionable ingredients, so I figured I should just try to make my own. This looks good. I am so impatient about rolling the crackers thin enough. This makes me want to try again! Have you ever tried these in a dehydrator? I’m wondering what the texture and crunch would be like…mine are always really, super crunchy when I bake them in the oven. Any thoughts? Staci, I have not tried the dehydrator. Give it a go and I’d love to hear how they turn out. When you say you get really, super crunchy crackers, do you mean with this recipe or in general? With this recipe, that is my goal to have crispy crackers because we like them that way. On the occasion that I don’t bake them long enough, they are softer. So you could always try baking less. I’m curious how the dehydrator turns out for you if you try it, so please let me know! OK so gluten I am not worried about ( am I? ) and i have a grinder so i can make some rice flour so I have like corn, wheat ( white and red ) rice, i think I have a little rye and maybe some soy. Wow that might be six! lol I have been meaning to look up soy and see if it is OK food and also to make sure this is not GMO but I have looked. So my real question is, drum roll please, how would I go about soaking these if I wanted to do that before baking? I know I have been through it in the ecourse but I am lost without just varying on your original recipe so I will watch it again while I eagerly await your response!… and go buy some nutritional yeast lol I dont think wheat germ will work instead ( will it?) AHK! Teri – I don’t know how to make this recipe soaked. 🙂 It is from before we did the “soaking” thing. As for 6 kinds of flour, well… when you’re baking gluten-free, more are better than one in terms of performance. The baked good usually turn out better with varied flours. I am (possibly:) ) very excited about this cracker mix! In all of my journeys to healthier eating and working my way through the fundamentals course cheez-its are the one thing my husband keeps asking me to make him. He wont stop eating the store bought kind until I do! If that will work this is exactly what I have been looking for. Thank you so much!